That is the title of my post for a couple of reasons. But, I'm going to back up really far in Liam's history for a second. Liam had to have laser surgery on both of his eyes due to stage III ROP (retinopathy of prematurity) disease while he was still in the NICU. Vessels at the back of the eye grow from the retina toward the optic nerve. In premature infants the vessels can grow abnormally. If the improper growth of the vessels are left to themselves they will cause the retina to detach and lead to blindness. Just a fun fact: Infants born at 3 lbs only have a 5% chance of developing ROP. Infants born under 2 lbs have a 40% chance of developing ROP. Liam weighed 1 lb 5 oz. Liam's eyes were checked every two weeks starting at 30 weeks gestation (January 15, 2008). His first two exams were normal and then BOOM! he's at stage III and needed surgery right away (by February 10, 2008). Liam's vessels didn't grow very far from the retina at all and were already starting to hemorrhage in one of his eyes. The Dr. said it was a very difficult surgery due to the fact that Liam's vessels hadn't grown out much. He had to laser a lot and he had to sacrifice Liam's periphreal vision to save the retinas. Liam's ROP disease completely regressed and he no longer has the disease. His blood vessels have now grown out properly but he still needs to be seen by a pediatric opthamalogist every 6 months to make sure everything still looks good. Kiddoes like Liam are at future risk for retinal detachment due to the surgery and keeping a close eye on them is prudent to say the least. Liam also has a little side issue related to vision but not to his eyes (brain and eyes have to coordinate in order to see). Liam has Cortical Visual Impairment which means that the eyes function just fine but the brain doesn't interpret everything correctly. There is huge variation in CVI from mild to severe. Liam's vision can continue to improve and he can move up the CVI scale making his impairment less and less of a factor in his ability to see. Last year Liam would be classified in the severe range (1-2) and now he is in the mid range (5-6). Cool, huh? Liam had one of his follow ups today at the Duke Eye Clinic. Six months ago Liam was looking at his books and smiling at them but wasn't looking at videos, tracking large pictures or seeing distances. He also was only slightly near sighted. Today, Liam tracked the largest picture, laughed at the animals on the video and without his glasses on, smiled at me when I stuck my face in front of his. What a difference 6 months make! The Dr at Duke differs in her opinion of Liam's correction on his glasses from what he received from the local Dr. Yes, he is very near sighted and needs correction, but does he need correction to 20/20 when his field of vision is in front him and not 20 feet away? It's a great point and one I would never have thought of. Does it harm him to have corrected lenses for 20 feet away when he can't see that far? No, but it does change the size of the objects he does see. So, they don't like to correct for anymore than a 3. Liam is a 12. That's a big difference! Argh! Liam's esotropia (independent eye focusing) hasn't gotten much better with his glasses yet. So, we are going to start the patching. The local Dr. here said we should patch one eye for the whole day and alternate the eyes every other day. The Dr. at Duke said to only patch the eye that turns in the most (his right) and only patch it for 2 hours a day. Argh! 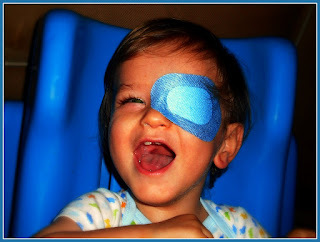 The only pirate I have EVER seen cuter than Johnny Depp :) Congrats on the great news! So stinking cute!!! My cousin had to wear a patch for a while. It did wonders for her. I know what you mean about the sensitive skin. Carver is the same way. I ALWAYS have a box of adhesive remover in the house. It works great. I even found a citrus scented one. What great news on the eyes. I don't know if I told you, but we don't believe Carver ever had CVI. We've been told that, but now it has been confirmed that he actually has optic nerve damage. Crazy! I would rather he had CVI. Anyway, to answer a couple of your questions... I think I found you on the Yahoo micro preemie group - just watching email posts. I love visiting because I feel like we have something in common - Liam and Carver. It's nice to have someone to relate to and to see how Liam is progressing and what you're doing with him.